'Karbala' is a place in Iraq, 100 km from Baghdad at the edge of the desert, surrounded by the beautiful greenery of fruit orchards and palm groves. Karbala is believed to have originated from two Assyrian words 'Karb' which means 'Sacred Place' and 'Ail' which means 'God'. Some also believe the word is of Persian origin formed from two words which are (Kaar) which means work and (Bolo) which means the higher, thus meaning the 'Higher Work'. A friend, Zoeb Asif shared some beautiful diamond shaped orb pictures from sacred sites, dargahs in Kerbala, Iraq. On Googling for diamond shaped orbs i found various sites and images, some say it's due to the diamond shaped iris inside the lens in some Sony cameras which make Orbs look diamond shaped. Some regular Orbs taken from the same camera in Karbala ! 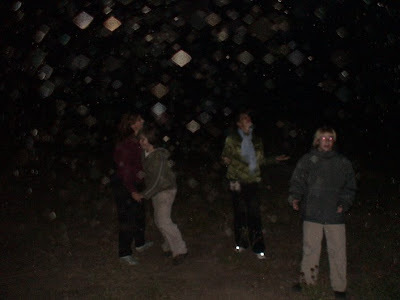 Some more diamond shaped orbs from James Gilliland's Sattva Sanctuary ECETI Ranch ! I've been photographing orbs for over a year now and was amazed that they had changed into diamonds. What's next?